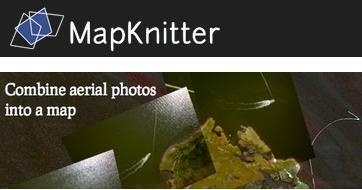 Mapknitter is an exciting new open source online application used to create maps using images collected by balloons and kites. Using the web site users can upload an image, rotate, distort and stretch it onto a reference map, and use the transparency and outline modes to check how close the fit is. Users can then export to GeoTiff or OpenLayers/TMS. The application has been created by Public laboratory for Open Technology (http://publiclaboratory.org). The Public Laboratory for Open Technology and Science (PLOTS) has created a community for users to apply the technology for environmental and pollution monitoring, though the software allows any map application. PLOTS provide an Illustrated guide to ballooning (http://grassrootsmapping.org/guide/) so users can start with little or no experience in ballooning and sell balloon starter kits (http://shop.breadpig.com/collections/publiclaboratory/products/balloon-mapping-kit). The web site itself is relatively simple to use, after completing a standard registration. Mapknitter itself comes with a basic introduction video which is recommended for those who haven’t had any experience working with mapping programmes. The main question Mapknitter poses is “Why bother?” For habitat surveys, archaeological digs, pollution monitoring, and other environmental applications it offers amateurs without access to complex mapping software a clever tool to make professional looking maps with a photo base collected from their balloon missions. Such tricky image stretching and skewing has usually been the preserve of expensive software and this opens it up to those on a tighter budget. For keen balloon photographers it provides another community to share ideas and come up with new ways to explore their hobby.